Since leaving Capcom, Mega Man co-creator Keiji Inafune hasn’t been able to touch his most famous franchise. He wants to make a return to the side-scrolling platformer games that made him famous but he’s going to have to do it with a new hero, the somewhat deflatingly-named Beck. Besides the disappointing name the game is looking pretty lovely and the ability to turn your arm into a giant sledgehammer sounds fun. The premise is that you’re the ninth generation of wicked cool transforming robots. All your previous generations have gone a little nuts after being infected with a computer virus. You have to work through the game’s six stages, thwacking each of the broken robots into pieces, upgrading yourself as you go along. There’s currently no footage of the game in action so we only have concept art to go on but it’s straight up good looking. 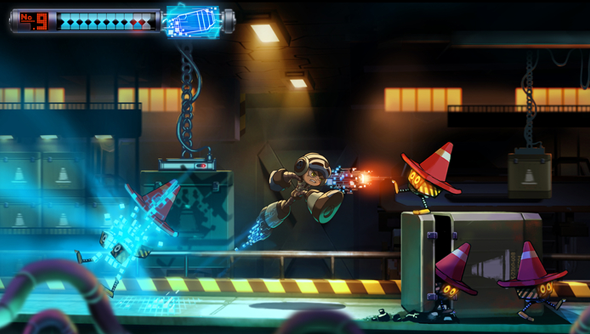 Inafune’s avoided pixel art and instead gone for a more modern, clean look to his platformer. It’s achingly similar to Mega Man in design. It’s going to tug on the heartstrings of fans of the original series just to look at it. Despite Inafune’s beginnings on console there’s currently only plans for the Mighty No. 9 to come to PC. Inafune’s looking for $900,000 to make Mighty No. 9 and in a single day of fundraising he’s already raised $480,000. You can learn more about the project and pledge over on the game’s Kickstarter page.